The basic recipe is from my aunt, Margie Alena Gilliland. 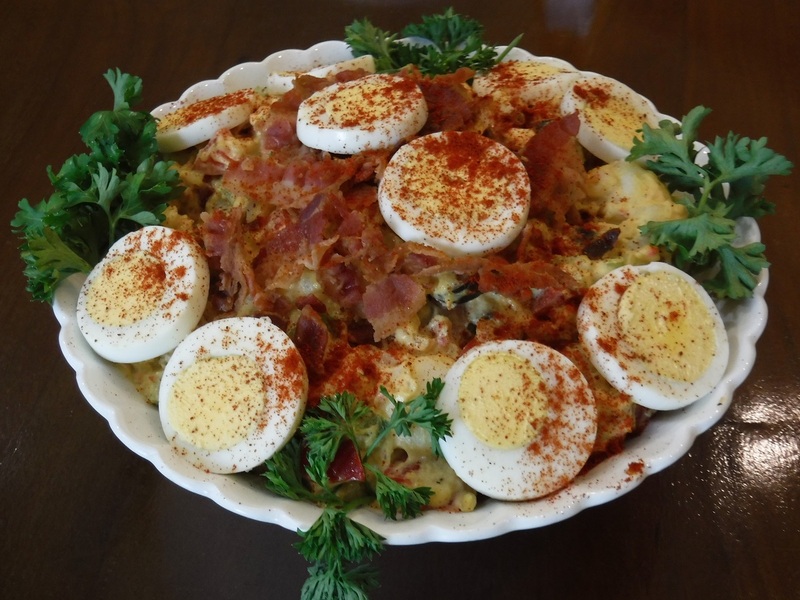 We have played with it over the years - adding this and taking that out but we always seem to come back to a close version of the potato salad that we fondly remember from the idyllic summers spent at Aunt Margie and Uncle Carroll's cabin in the mountains of the Angeles National Forest. This recipe, as given, was for the family gatherings and it feeds many. The recipe, with the possible exception of the mayonnaise and mustard portions, cuts in half easily to make a more manageable portion. 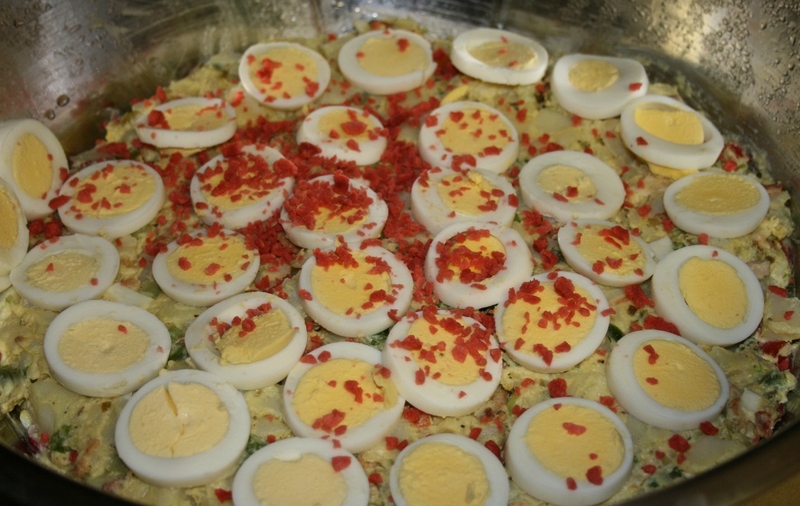 It is different from most potato salads in that it does not use vinegar to make it tart but it does have just a hint of sweetness from the pickle relish. Use a few sliced gherkins to sweeten it even more. Wash potatoes with scrub brush, leave skin on. Place in large pot, cover with water and bring to a boil. Add 1 tablespoon salt to the water. Cook until fork enters without undue resistance. Drain immediately taking care not to bruise or crush the potatoes. Allow to drain dry and cool. After potatoes heve cooled to touch, peel using a sharp knife to scrape off the skin. Dice potatoes and place in a very large bowl. Hard boil the eggs, shell and slice. Reserve the center 3 or 4 slices of each egg, dice the remainder and set aside. Crisp fry thre bacon and drain well on paper towel. When cooled, crumble into small bits. Trim any fat from the ham. Dice finely. Wash and trim vegetables, Dice. Allow any excess moisture to drain away. Be sure to include the green stems of the scallions. Add bouillon cubes to 1/4 cup of boiling water and mix well to make a watery paste. Add the paste to the diced potatoes and toss to cover all of the potatoes wioth the bouillon. Add the diced vegetables, eggs, crumbled bacon, spices, ham and bacon bits. Add the mustard and mayonnaise. Mix so that vegetables and garnishes are all mixed well with a uniform coating of the mayonnaise and mustard. Let's face it. With this size recipe and pot in front of you, you just don't have a spoon large enough to mix it up. So, roll up the sleeves, wash and scrub the hands and forearms and use the hands as the mixers. Believe me! Its the only way. Place the mixed salad in a serving bowl. Cover with the reserved center slices of the egg and sprinkle with paprika and crumbled bacon. The potato sald is now wonderful and ready to serve. However, if you have patience and will power, it will be much better tomorrow after the flavors have had the opportunity to mingle and meld in the refrigerator overnight.